Defining research objectives is the most important step in designing a marketing research plan. Objectives decide interview topics. They shape the questions you ask,and guide your analysis and reports, pointing you in the right direction. Objectives get you actionable information and knowledge. You want actionable information and knowledge from qualitative marketing research. The first step in defining research objectives is to identify the research problem. Then you identify major topics you want to cover. Once you understand the research problem and topics, you define the research objectives. Clear marketing research objectives arise from a clear explanation of the research problem. Often, clients do not have a clear idea about the research problem. In fact, poorly defined research problems cause most marketing research failures in consumer research. So, the first questions you need to ask are about the research problem. You diagnose the problem. Here are six questions to diagnose and clarify the research problem. What is the circumstance that demands research? Who are the stakeholders in the decision? What decisions will the research information support? What does management want to learn that they don’t know already? What specific information does management need? What will the research report look like? Whenever you start a project, ask the six research problem questions to clarify the research problem. Spend enough time until you and your sponsors or clients agree on the research problem. Once you understand the research problem at a general level, you define major topics you want to cover. What is the single most important question the research must answer? What is the second most important question the research must answer? What is the third most important question the research must answer? And so on. Now you have your major topics for your interview guide. Stick to three to five major topics for a focus group or depth interview. More than five topics take time. You will not have time to explore each topic in depth. Some typical examples of topics are brand awareness, product use, buying behavior, brand positioning, and switching. The example is not exhaustive. Write a sentence that specifically describes the interview action. What needs to be done (action)and with whom (segment). Write a second sentence about the information you need. Write another sentence that describes how managers will use the information. In summary, you describe the interview action, the information you seek, and the how the information will be used. Here is an example of an objective from the mobile phone industry. Get reactions of college students, who use wireless smartphones, to four different mobile multimedia concepts. Find out their preferences, rationale, feelings, and beliefs about each concept. Product managers will use the findings to screen concepts for further product development and quantitative research surveys. When you write your objectives, be specific. Start your action sentence with an action verb. Identify the segment. Specify the information you need. Then describe how you will use the information. Write an objective for each major topic. List the objectives in order of importance to management or your client. Ask your sponsors if they agree with the objectives. This is important. Avoid misunderstandings down the road, by getting agreement at this stage. Here are some examples of poorly written objectives. They are too general. Talk to consumers about our new product ideas. Ask telecom-purchasing managers what they think about buying VOIP telephones. Ask Webmasters what they think about mashups. Writing clear objectives is the most important step in designing qualitative marketing research. Follow the steps in this article. And practice. 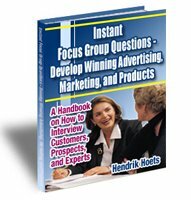 Instant Focus Group Questions-e-Book is packed with techniques and hundreds of focus group questions. To learn more, click on the e-book icon.